I’m heading south tomorrow, with my new pal Laurie, who blogs over here. She’s flying in from California, staying overnight chez Soup, then tomorrow we load up the ‘Burb and drive to Virginia Blogfest. Two chicks in a car? On a roadtrip? Does that remind you of anything? Oh yeah, we’re a couple of badasses for sure. Don't mess with badass bloggers! Posted on July 15, 2009 by MegPosted in blogging, dated references, Old enough to know better, travelling, vacationing, womenTagged blogging, Foolery, road trip, Virginia Blogfest. It’s our Facebook profile pics!! So, which one of you gets to sleep with Brad Pitt? We’ll shoot for it. Best two outta three. Stay away from driving off cliffs. Oh wait, you’ll be at the Bay, so no worries there! I think the worst trouble we can get into down there is getting lost on a dead-end road. Hilarious! 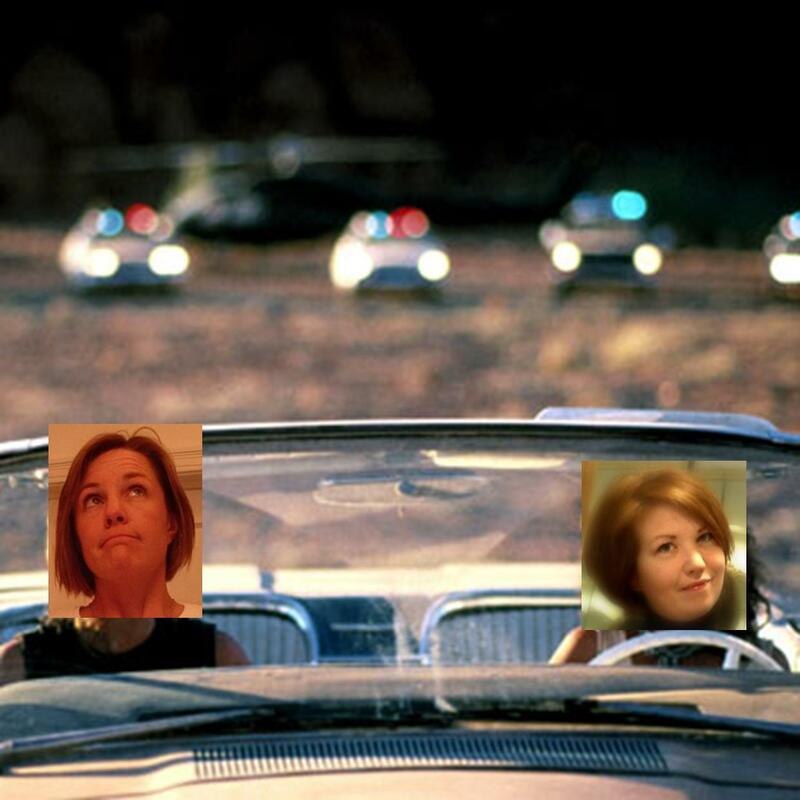 You two gals have a FABULOUS time, and come back with lots of good blogging material!!!! How funny! Have a fun road trip to Mathews, and can’t wait to meet you both. Look forward to seeing you, Roomie! Oh geez, you should’ve come! We had fun touring around the bay region in Mathews County. I’d have swung by, but we took the eastern route so I could drop Foolery at BWI. Next time though!! Two wild and crazy women! This is well-covered territory here, but here it is again–I’m so jealous! 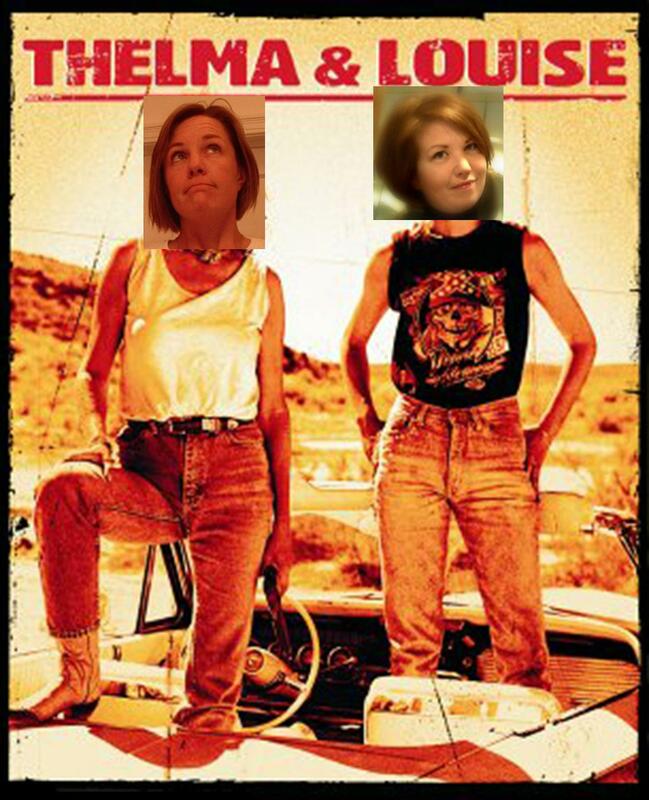 You two are much cuter that the first Thelma & Louise! Suz – start saving your spare change and by next year you’ll have airfare! I provide top-rate airport shuttle services to any of the DC airports – ask Foolery. Noe Noe – That’s about how it was, too! Ann – Aw shucks, thanks!